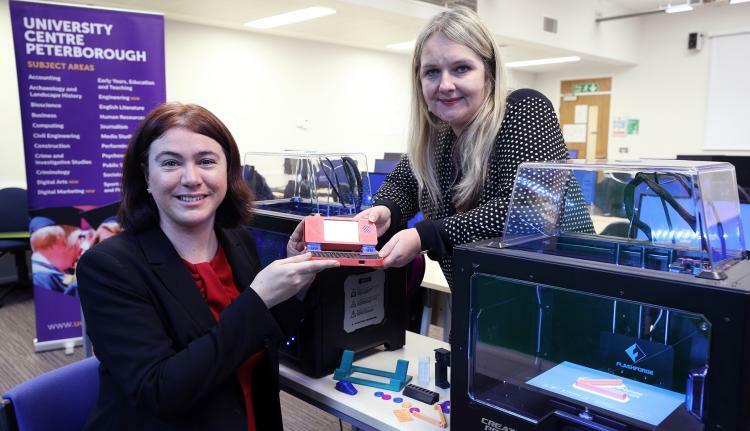 Alex Mayer MEP for the East of England visited University Centre Peterborough on Friday 23rd November to see how state-of-the-art 3D printers are used by engineering, computing and digital arts students in their studies. The new equipment will give students the opportunity to learn hands on how to prepare them for a career in industry where 3D printers are used to make inexpensive prototypes efficiently and create digital sculptures and artwork. The number of job adverts asking for 3D printing skills increased by 1,834% between 2010 and 2014 and the market is expected to be as big as $21 billion globally in 2021. The creative and digital sector was formally identified by the LEP (Local Enterprise Partnership) as a key regional growth sector priority. One of Peterborough’s largest sector of employment are scientific and technical services which require digital and technological skills. Within these businesses, there are skills gaps and an inability to recruit skilled individuals which is where future graduates play a key part in meeting these needs. “We are building digital enhancements in all areas of our delivery and course design which has been reflected in our constantly evolving course offering. Computing and engineering is being developed alongside our new FdA in Digital Arts and FdA / BA Digital Marketing degrees, which will enable businesses to better target, retain and understand the motivations of their customers. The need to identify cheaper methods to design artefacts and concepts is made possible by the digital revolution and we’re ensuring that our students and centre is at the forefront of this within the region.